Didn't Get the Memo - all finished up! Finally finished up this little quilt! I love it. 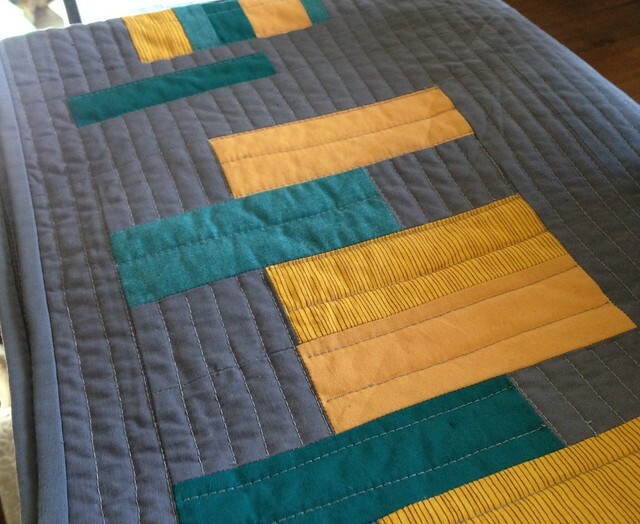 The quilting looks like it was randomly done, but it wasn't. Each line follows along the edge of a different triangle... 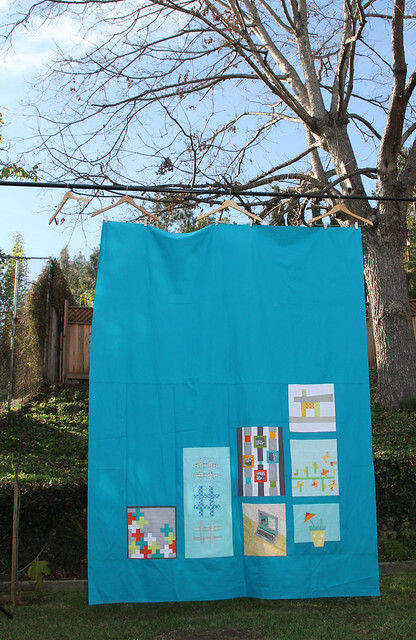 This was one of those quilting situations where you really aren't sure you're doing the right thing as it's happening, but the end result is fantastic. I'm really happy with the overall effect! I took a quick video of it for Instagram and thought I'd post it here too! Tomorrow I'm headed up to Sisters, Oregon a week to teach and speak! I'm so looking forward to it. I should be a wonderful time. I'll post all of the mini quilts I made for class samples soon! 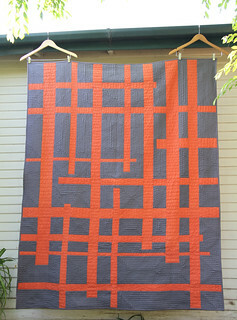 I finished up my quilt that I made with Jay McCarroll's latest line, Center City. 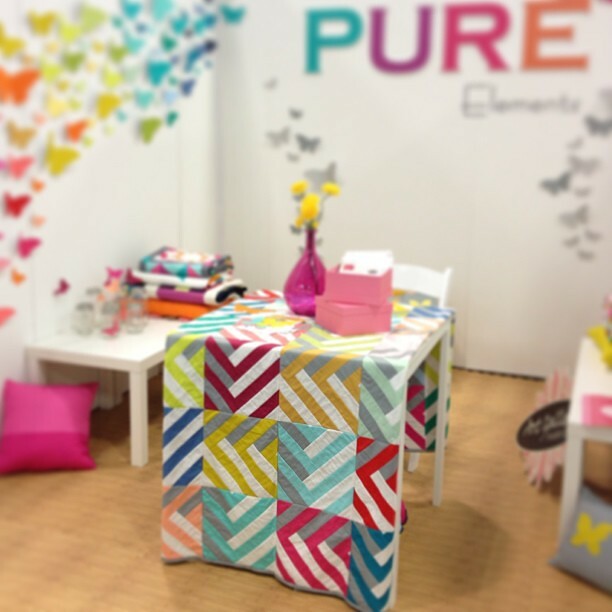 Of course I included lots of solids too to really make those prints shine! It's a different spin on this same idea...Lots more improv piecing this time around. 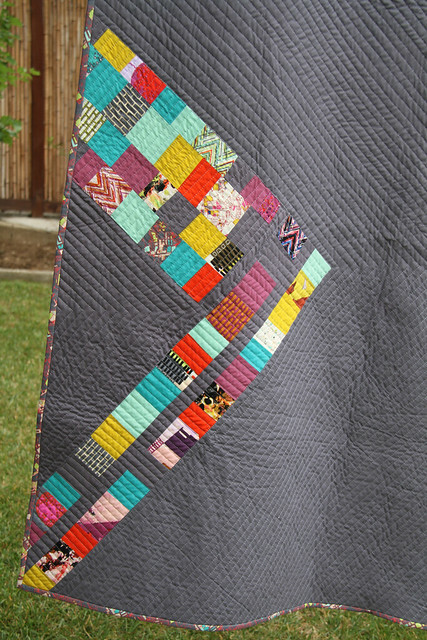 The more time I spend quilting the more I'm realizing that I like repeating some main design elements. But I think there's something to be said for exploring a theme for a bit... I like each one a bit more than the previous! For the back I used some big pieces of the same line. 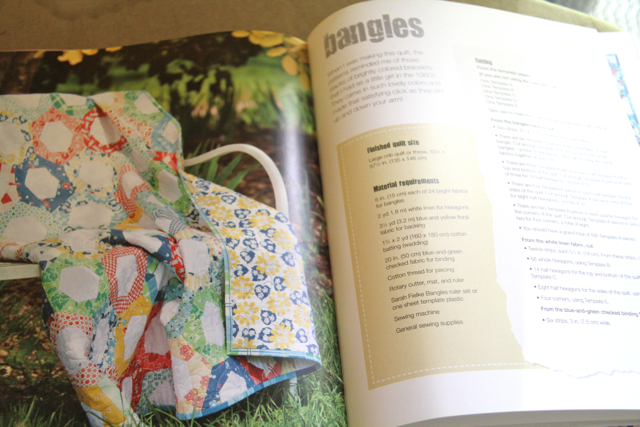 Of course there's loads of straight-line quilting and I also bound in my favorite print of the line. I so, so love the binding on this one. 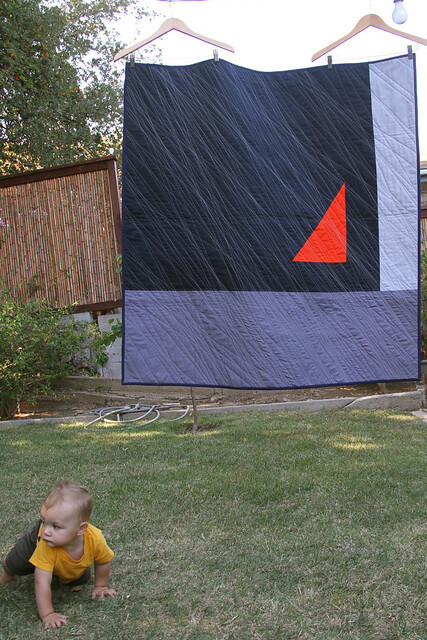 It's so nice to get another quilt finished up! Got this quilt top finished up over the weekend. I think the name of it is pretty self explanatory! 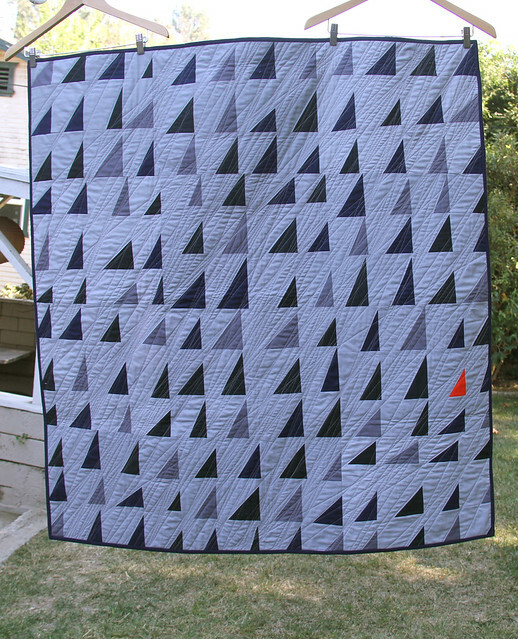 It's hard to tell in photos but these darker triangles are actually both navy and black. And the one orange one is Kona Flame. It's such a great color. As of this week I'm back to working from home so I hope to find the time to finish this one up soon! Catching up after a weekend up in Portland at Quilt Market. 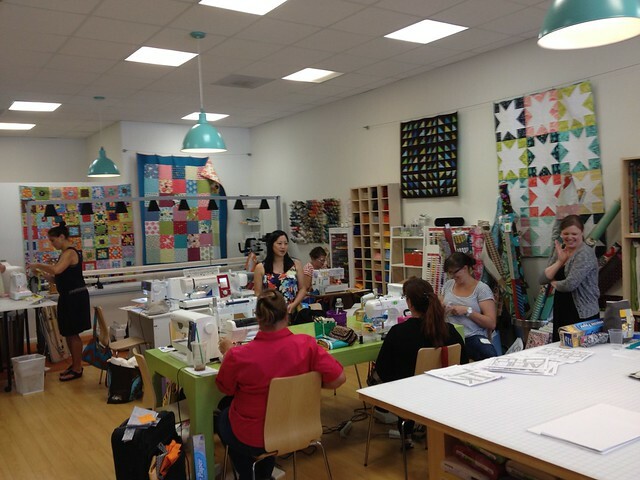 It's always so much fun to see all of my sewing friends in person! 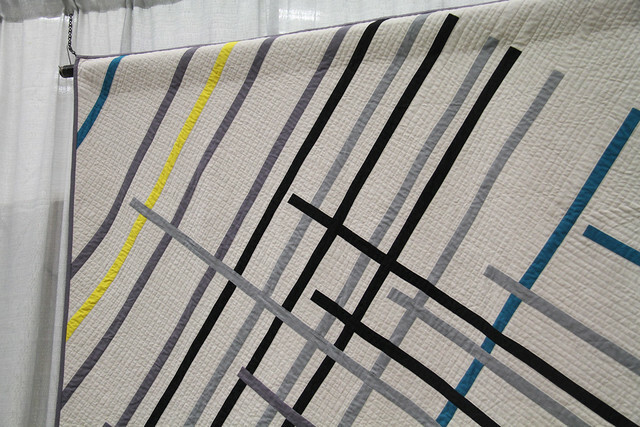 And how great see one of my Modern BOMs being used in a quilt the Art Gallery booth! 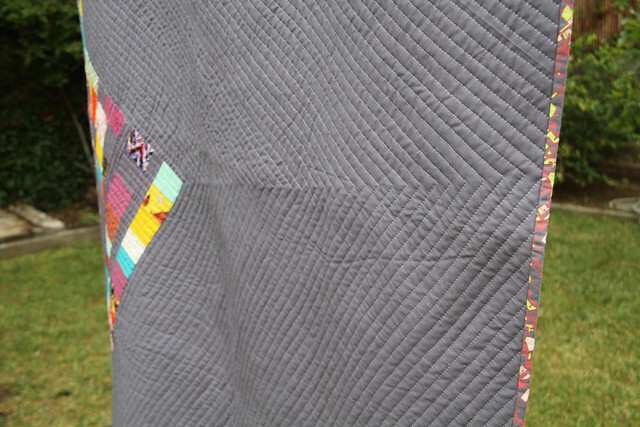 I'm finally finding time to announce the winner of Hand Quilted with Love. Exactly 100 of you commented and the random number generator gave me number 4. The winner is Kat! Congrats and keep an eye out for an email from me. 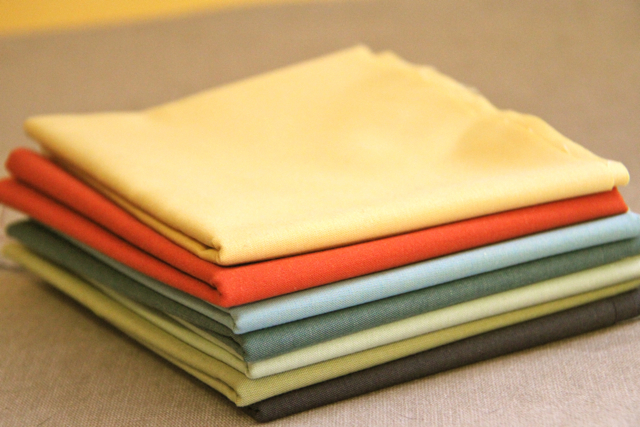 A long weekend and some sewing is on the horizon. Hope you all squeeze in some sewing time too! 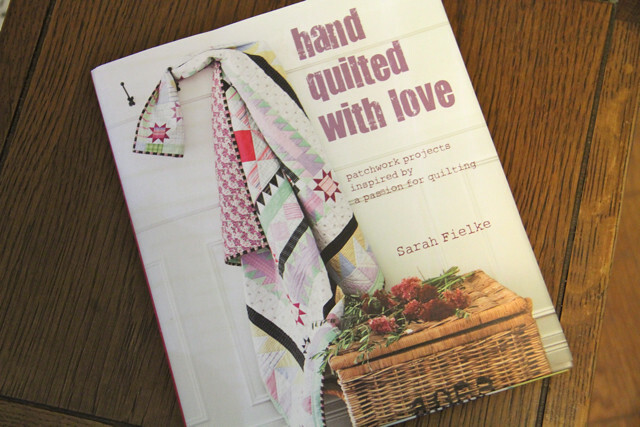 Today is my stop on the blog tour for Sarah Fielke's latest book, Hand Quilted with Love! Before I get to the content, let me first mention that the book is a beautiful heavy hard cover. You know how a hard cover will just sit solidly open? 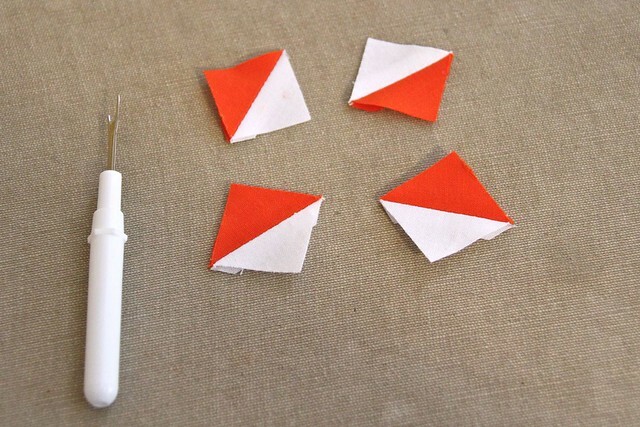 Such things are important in a sewing book! There is really such a nice feel to the book itself. 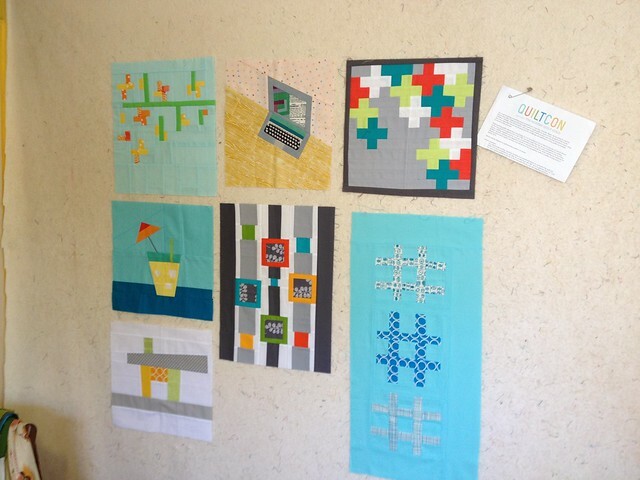 And the quilts! 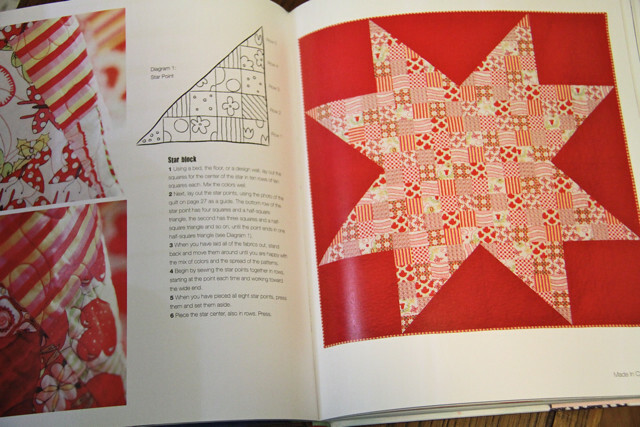 Sarah's lovely vivid style is all over the book in the 16 quilts included. So many great ones! I was instantly drawn to her Bangles pattern. You know that I'm all about the solids so of course they are what I turned to. 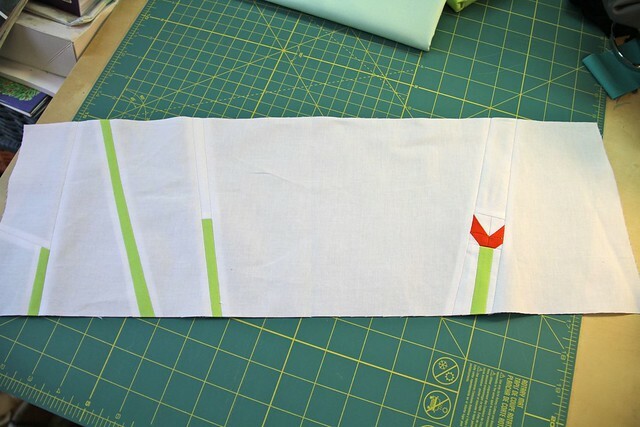 With templates and Y seams, this pattern isn't in my wheelhouse but I so enjoyed working on it! It's really fun to occasionally work on something that's very different from my usual piecing. And guess what? Cico Books have been generous enough to donate a book for a giveaway! Leave a comment and I'll pick a winner in a week. Have squeezed in very little bits of sewing here and there recently. 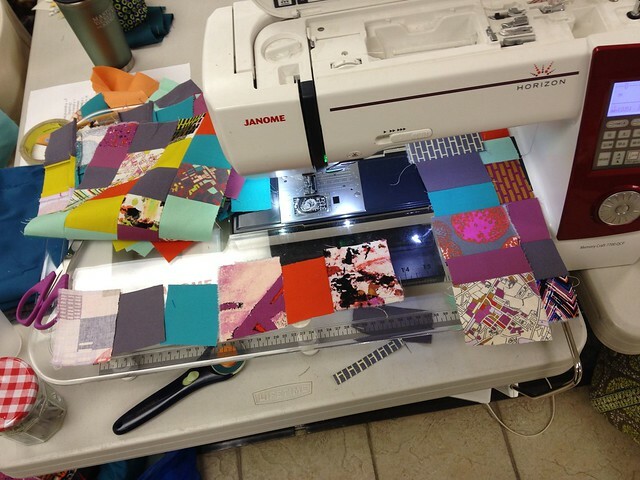 The Traveling Quilts always allow for a fun creative stretch! For Penny's quilt, I received these blocks. The whole angle is growth and spring... I wanted to add something that was my aesthetic but matched the rest of the already existing blocks. To me growth is about those first pops of green and the first flower that blooms. ...lead to this! And now it's all been shipped off to Elizabeth for her addition! April - 2013 is flying by! It's been radio silence around these parts as I transition back into being at my day job. Just three months and then I'll be back to working for the MQG and from home again. Meanwhile, it's hard to find any time to get in front of my sewing machine. I miss it! The usual story, right? Finding balance between work, family and fun is always hard! Meanwhile, when I do grab 30 minutes or so I've been working on some class samples for when I teach up at A Quilters Affair up in Sisters, Oregon in July. Are you going to be there? If so, I would love to meet you! I'll be giving a couple of talks too, so it should be a really fun week! Anyhow - these class samples are coming along nicely and I'll be sure to post them here when I've finished them up! BTW - are you on Instagram? I've mentioned it before, but I'll mention it again because I'm over there so much more than I find time for blogging... Follow me if you wanna. 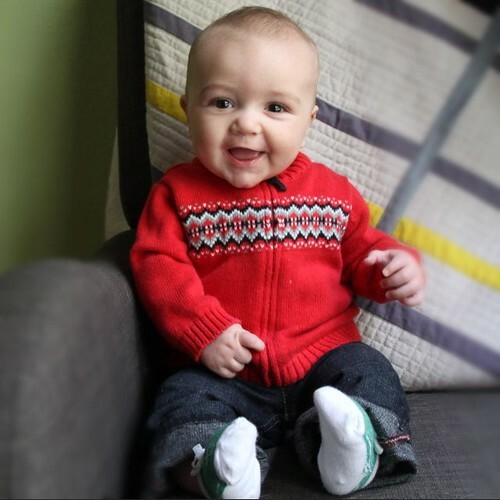 You'll see a whole lot of my baby too so though maybe it's not for you if baby pics aren't your thing. Ha. Hope that you get a good start to your week as April is here! 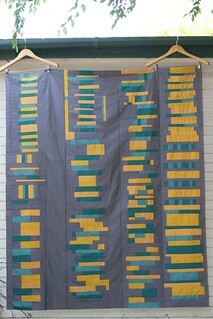 Another quilt that I had hanging at QuiltCon was this group quilt, made by the members of Bee Imaginative. I have posted about what inspired these blocks here. 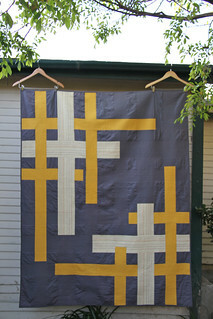 I finished it up by quilting the backgroud with dense straight lines. Then I went back and filled in the piecing with straight lines in the opposite direction that are set further apart. 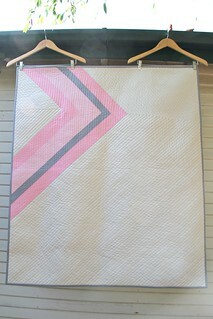 I am so happy to have finished up this quilt. I often put my bee blocks to the side with every intention of putting them together into a top, and suddenly two years have passed and I still haven't found the time... 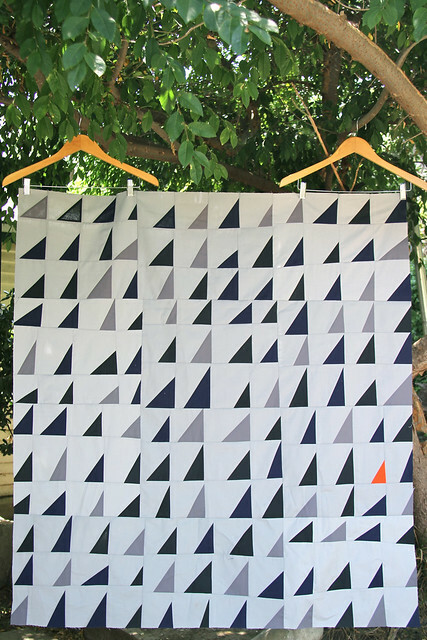 Thrilled to get to use this wonderful quilt! 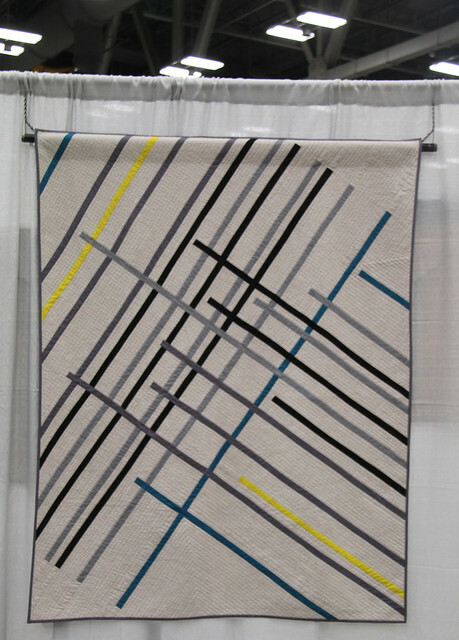 I was proud to have quilts hanging in the QuiltCon show. One of them was Bias which I've posted about a couple of times while it was in progress. 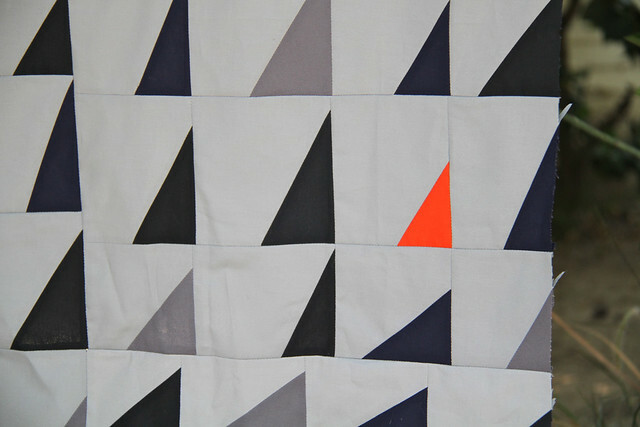 The quilting on this is all straight line, echoing the piecing design. 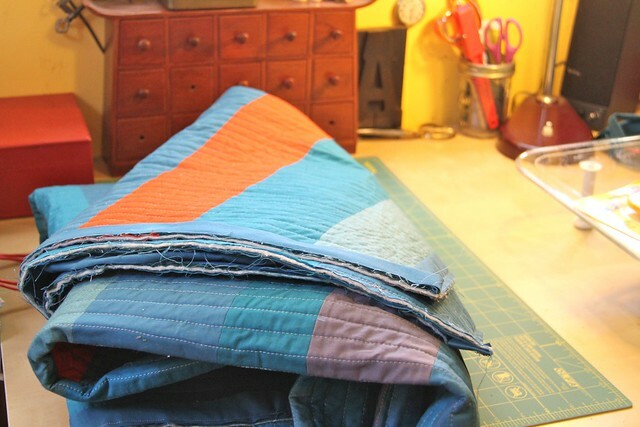 It took foreeeever, as this dense straight line quilting always does. Good thing there was a deadline to get it finished because it was hard to get it done! 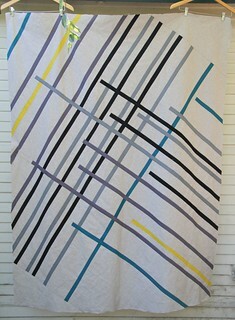 I think that this quilt is a nice balance of clean, uncomplicated design, while also having interest. I'm really happy with it! The registration desk, quiet the day before the show started. Me and Heather Grant, focused and talking out some detail a couple of hours before the show opened. The amazing Denyse Schmidt exhibit is our backdrop. 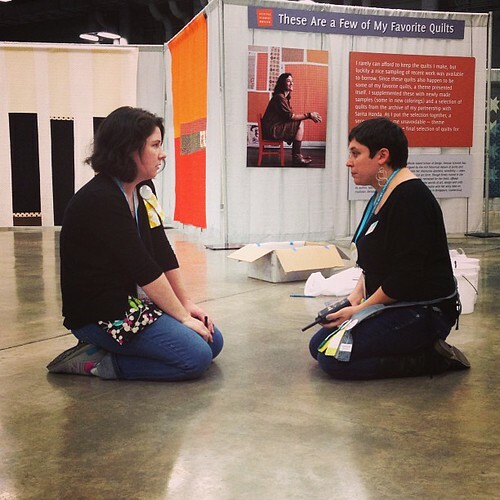 Heather and I have been talking daily for over a year as we've worked to make QuiltCon happen. She's become a great friend along with being a coworker. 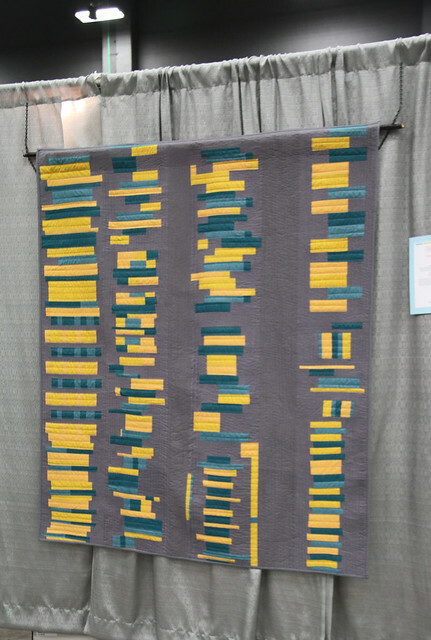 It was her knowledge and abilities that made QuiltCon as organized as it was. 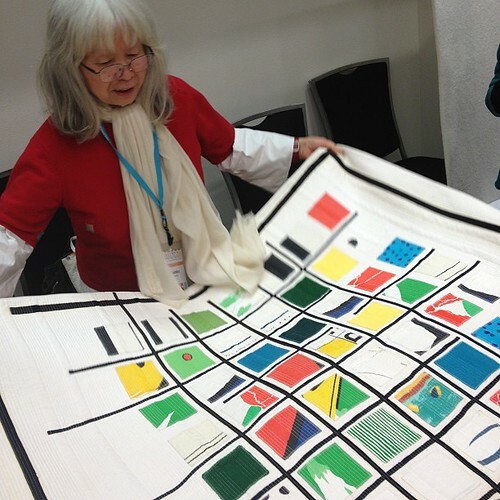 The one workshop I made time for was Yoshiko Jinzenji's. She brought a lot of her work with her and it was amazing to see it in person and talk with her about it. A true inspiration. 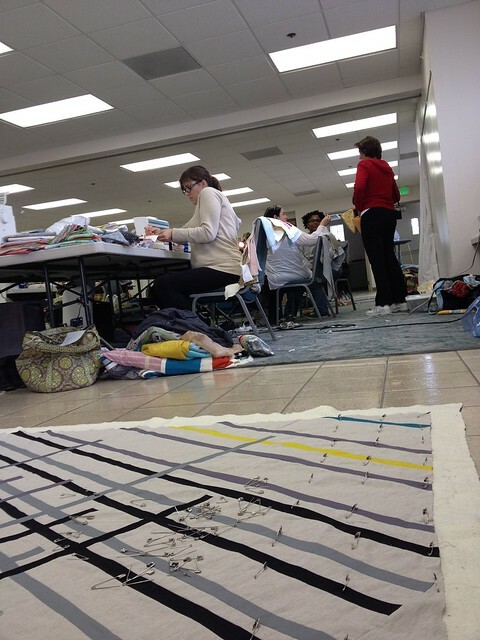 Modern quilting is pretty amazing but it's the people who really made the event what it was. The staff, volunteers, teachers and lecturers were all so giving of their time, energy and hard work. When we all worked together and put our time and energy into it, we were able to make something truly vibrant and exciting happen. 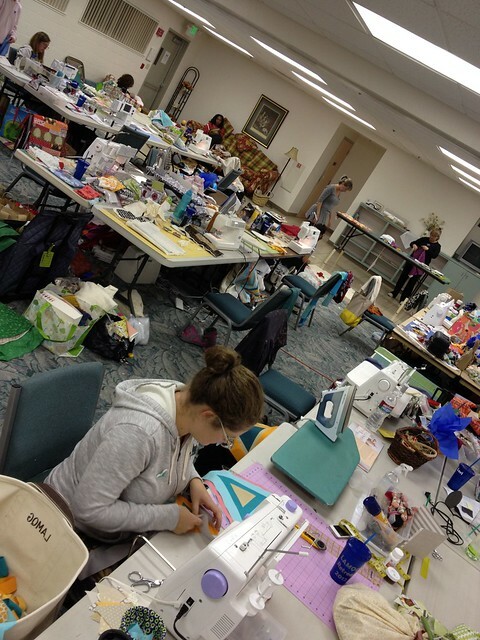 The modern quilting community all came together for a weekend and it was just amazingly fun. 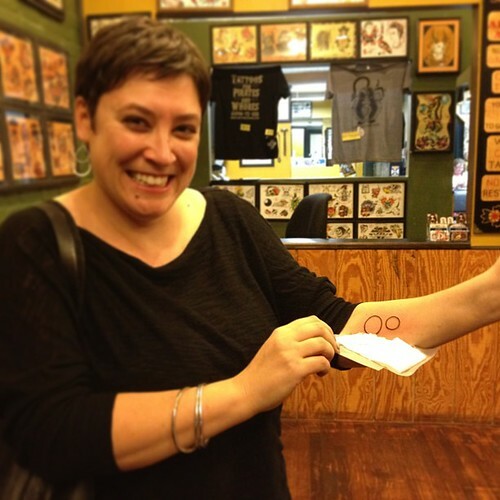 Oh and I got a tattoo! (Hi Mom!) I was certainly not the only one - there were loads of attendees getting them. It's representative of my husband and son and for an extra lil' quilty touch, the circles are set a perfect scant 1/4" apart. Ha. You can see a lot more of the show and the quilts in the QuiltCon flickr group. 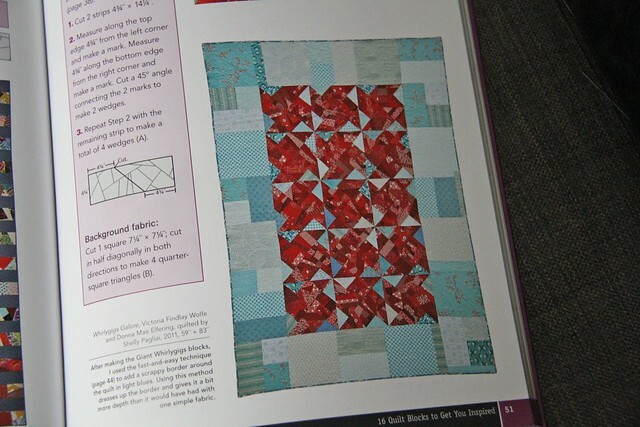 Hope that those of you who were at QuiltCon has as much fun as I did, and I hope that the rest of you are making plans to go in 2015. As tired as I still am, I can't wait to do it all over again! 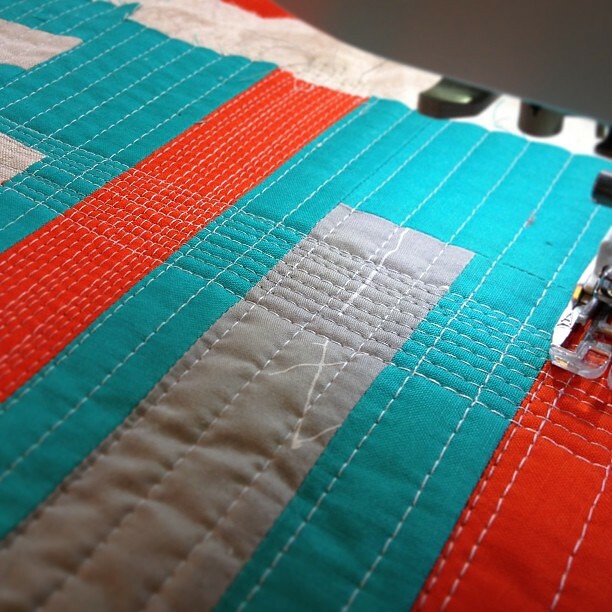 I apologize that I've been such a slacker about blogging but it's 100% because I'm just so busy with all of the work of getting ready for QuiltCon! We leave today on our road trip to get there and then it all starts one week from today! 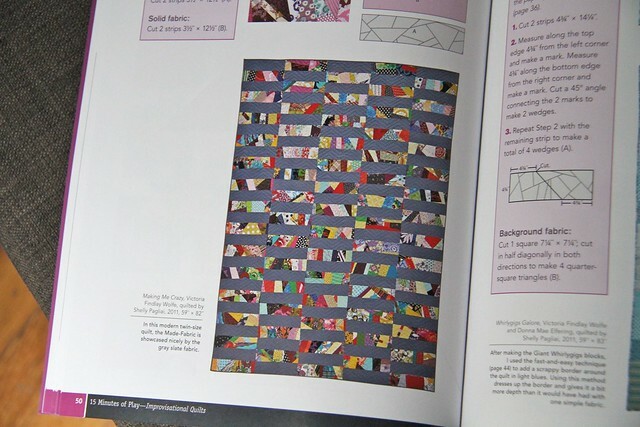 I will be signing books in the Quilt Haus booth (booth 314) on Saturday the 23rd at 1:00 pm if anyone wants to stop by and otherwise, you'll see me because I'll be around. I'll be workin', workin', workin' and enjoying myself too. I hope that I get to meet you there! 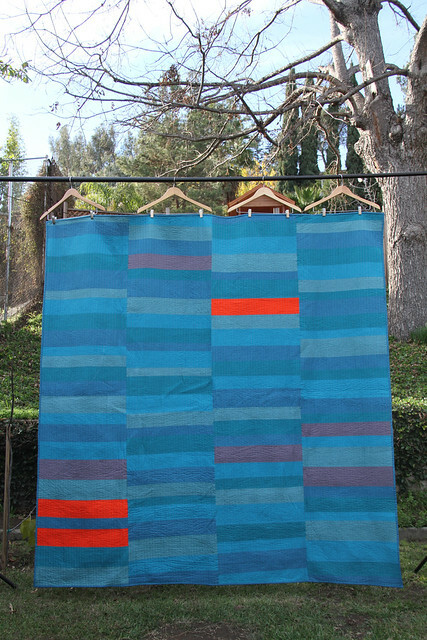 Oh and yes, I do actually have some finished quilts that I'll finally find the time to post about now! And then they want five things about you... maybe a lot of you have seen how this is going on over on Instagram? 1) My sewing space is NEVER as clean as it is in that photo. I knew a photographer was coming. It's usually a complete and utter disaster. 2) I'm an identical twin and live next door to my twin sister. It's really great. 3) I'm left-handed and love that I am for no good reason other than that it's just awesome to be a lefty. 4) I met my husband through an online dating site. It works! 5) I grew up in rural New Hampshire but have lived in LA for almost 20 years now. How about you? 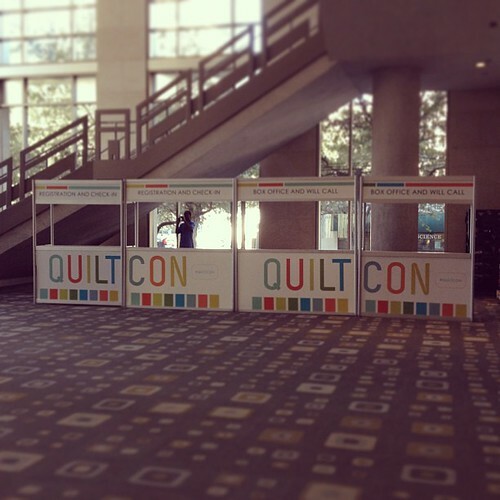 If you're headed to QuiltCon at the end of the month (it's so soooooooon!!) add your link and I can't wait to meet you there! 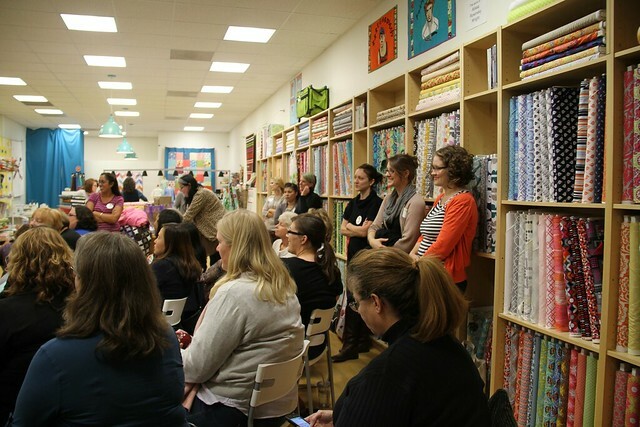 This weekend is the blog tour for Visit Your Local Quilt Shop Day! 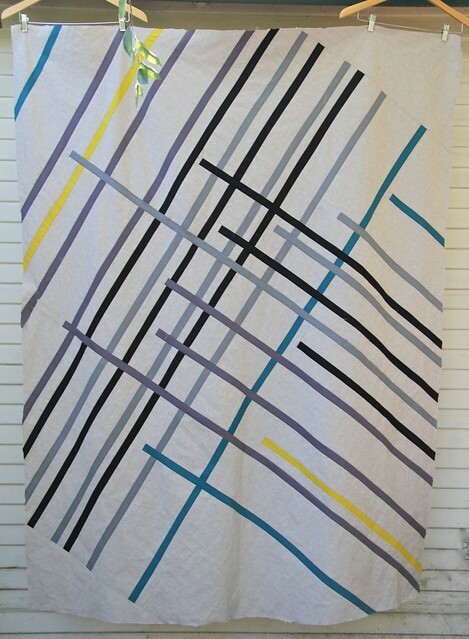 I decided to take part because I LOVE my local quilt shop, Sew Modern. 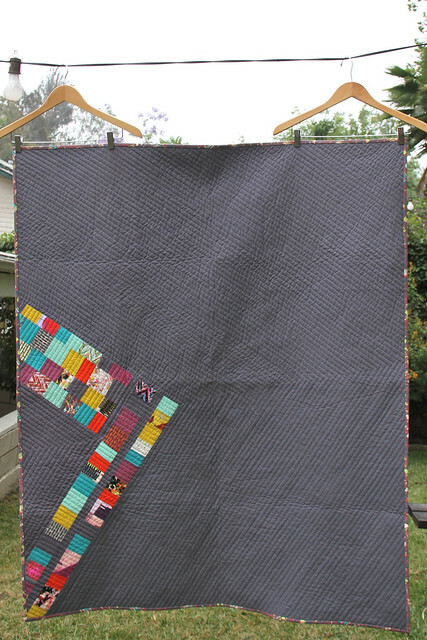 I'm not the usual quilting story in that I came to quilting through the internet. Flickr and blogs brought on my love affair - not taking a class or a shop I visited. 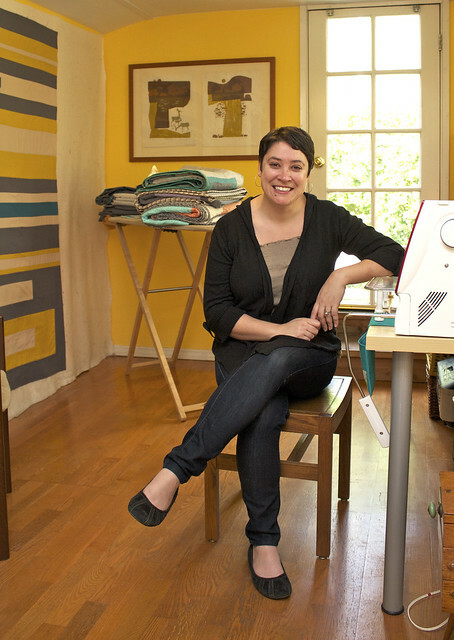 I didn't have a local quilt shop until I was an avid quilter. Sew Modern was opened up by a friend and fellow LAMQG member. It's pretty much the clubhouse! 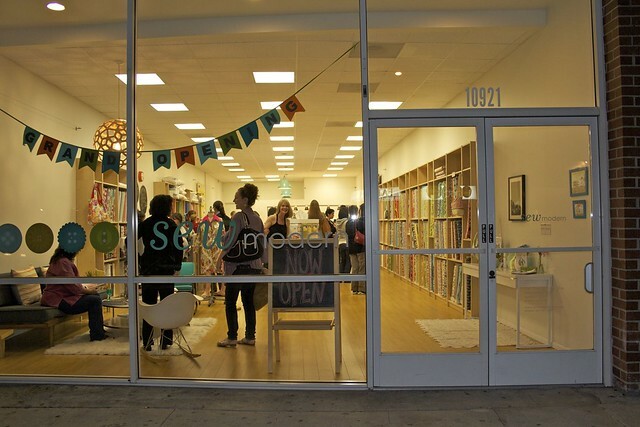 Aren't we lucky here in LA to have such a wonderful shop to spend time in? Nothing can replace the sense of community that seeing people in person provides. 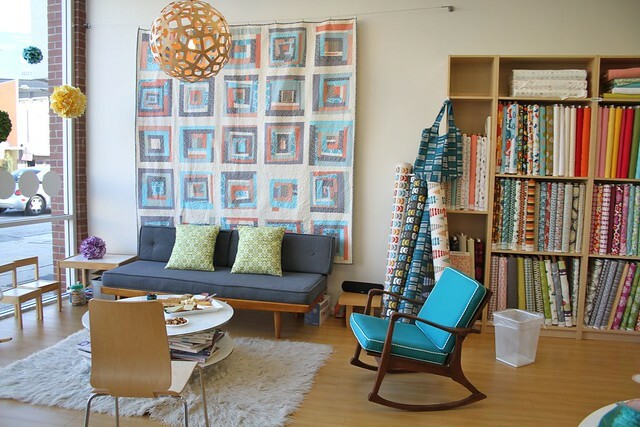 When I am at Sew Modern I always run into my quilting friends. Everyone loves catching up over some sewing machines and rotary cutters! And I haven't even mentioned the FABRIC! Being able to see it, touch it and mix & match with the bolts is a sort of fun that you can't have when you're shopping online. So don't forget that January 24th is Visit Your Local Quilt Shop Day. I hope that you'll hit up yours! In a Sea of Blue finished! Remember this idea? Well I got this commission finished up about a week ago. My first finish of 2013. It's a big queen sized quilt. And look, I'm taking a flat photo of it! Very exciting stuff. 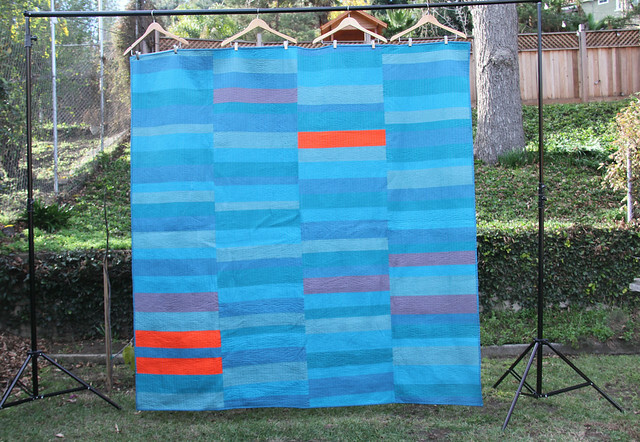 This is because for Christmas my husband got me a great photography set up for my big quilts. Until the day comes that I have some fabulous enormous studio space where I can shoot my big quilts, this will be my set up! I need to figure out a better clip and hang system than the clothes hangers but I will... and then I'm hoping that I get the gumption to take it different places beyond my sister's back yard. 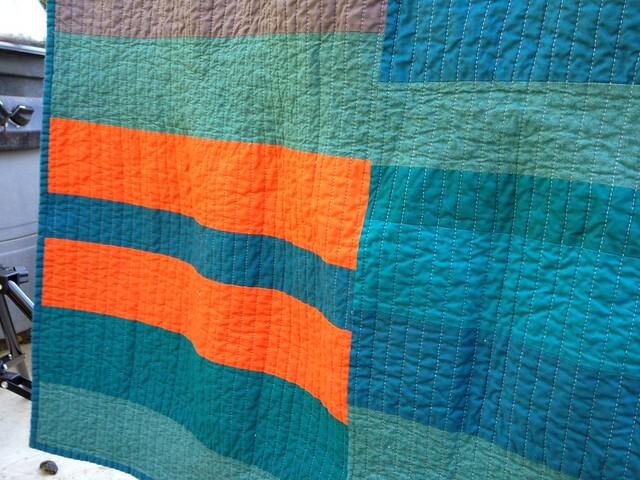 Here's a detail of the quilt after I'd washed it (these first photos are before I washed it) and it got that nice crinkle. I'd say that the colors are truest in this photo. The orange is Kona flame and boy is it bright! But in this sea of blue it works. 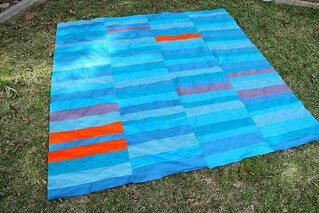 I was thinking about using negative space differently in this quilt... sorta like I pieced it with all of the blue. I know it doesn't really read that way, but it's an idea I hope that I find more time time to explore in the future! Then it was time to make some decisions about how to use them in the lay out. Since the quilt is going to be long armed, I thought I'd leave lots of negative space that can be filled up with some beautiful quilting. This bright vivid blue is also perfect for kids. You can see my process in this photo. I use Illustrator and design to scale. 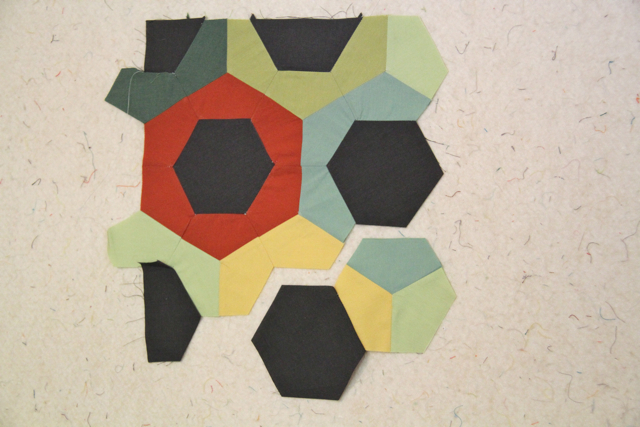 This makes it easy for me to sort out how big the fabric surrounding the blocks needs to be. 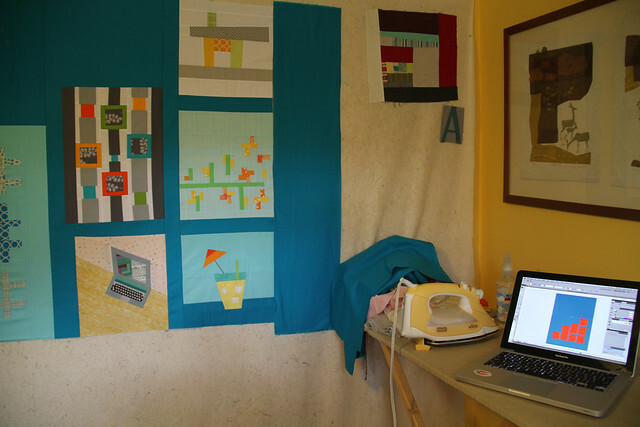 Another lil' note about this photo - those two bits of sewing in the upper right of my design wall? I leave those there all the time as a constant reminder about what I should focus on with my quilting. 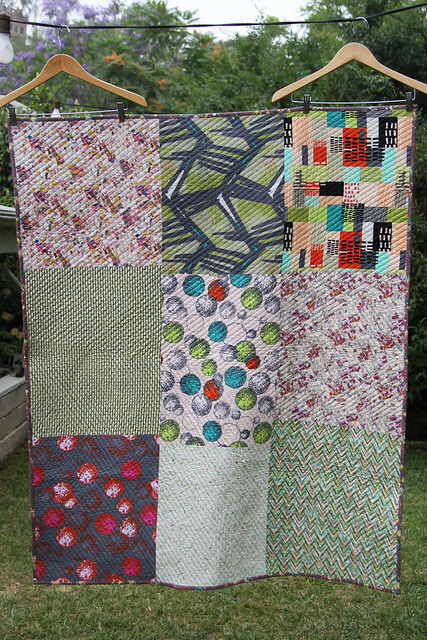 The wonky log cabin was sewn up with Denyse Schmidts' fabrics (I was sure she wouldn't mind!) that she had brought for the LAMQG workshop and that I had in my house for about a day before mailing them all back to her. 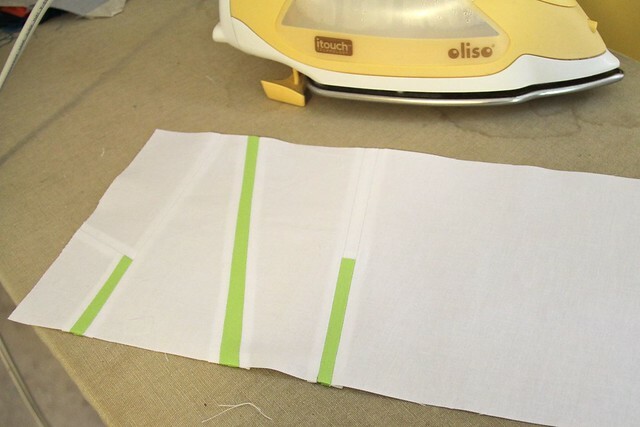 The A was sewn up in Elizabeth Hartman's workshop using her freezer paper method. These two bit of sewing, to me, represent the 1) the freedom of design and sewing without thinking and 2) the importance of good craftsmanship. Having those there as a constant reminder is a good thing for me. Anyhow - here's the finished top and now it's off to be quilted! 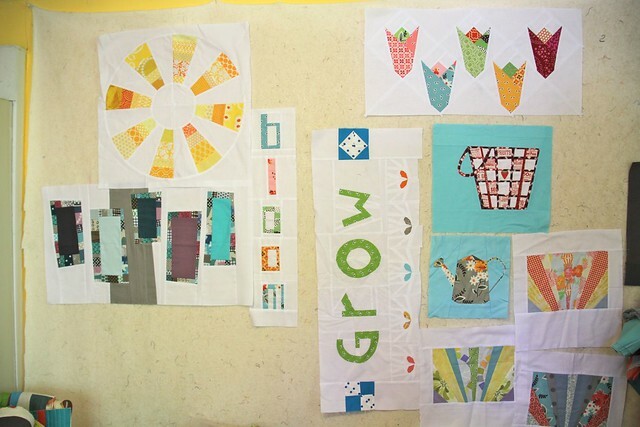 I don't know about you, but I'm certain these quilts are going to add a lot of vibrancy to the shelter. 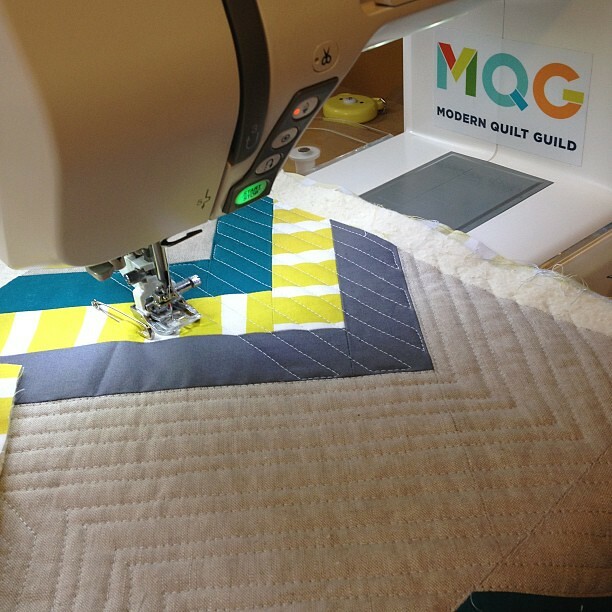 So thrilled that together the MQG can do this great charity quilting! I'm proud of all three but I sure do wish I'd had more hours at the sewing machine... But that's ok! There are other quilts that are almost finished! Hands down my best project of 2012. Happy, happy new year to all of you and here's to many more successful projects in the coming year! 2012 coming to an end! Boy that year flew right by, didn't it?? I'm determined to get some good sewing time in these last couple weeks of the year. Quilts will be finished!! I'm shooting going to get these three done before the new year! Yeah, that first one is from June 2011 - the waaaaay back machine! Let's see how I manage. Other stuff - a winner of 15 Minutes of Play was picked and contacted by Victoria. And also, I'm on Instagram! Are you? I love it. You'll be certain to see loads of my baby, but I post my sewing as I'm doing it too. Follow me if you wanna! 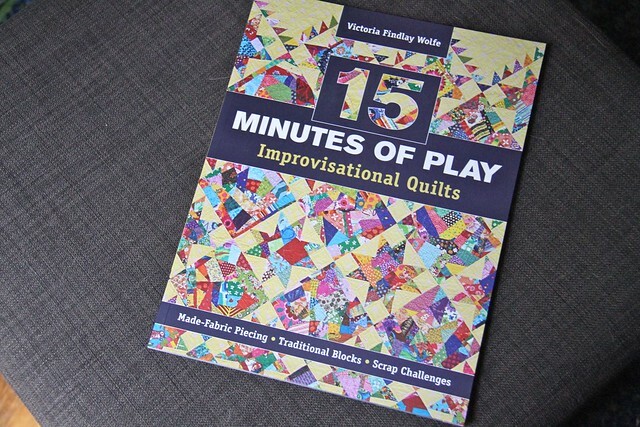 Today is my stop on the blog tour for Victora Findlay Wolfe's book, 15 Minutes of Play. Victoria's idea of just playing with fabric for 15 minutes a day is a great one. It keeps those creative juices flowing, even when you're very busy or feeling a lack of inspiration. I should take her advice more to heart! 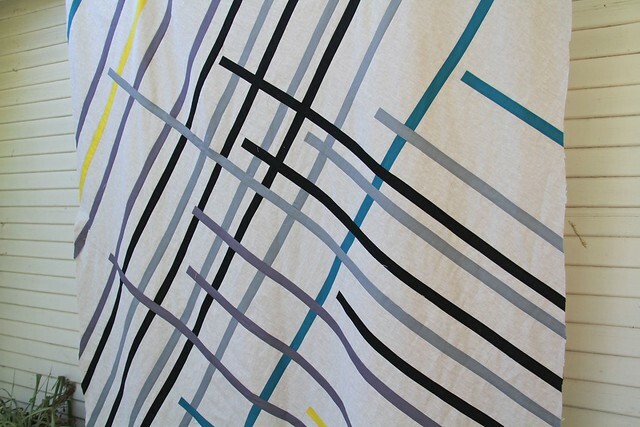 I work with fabric all the time, but sometimes I need to think of it in a more playful way. Victoria's book focuses on that process and the inspiration it can lead to. Such a great approach! In world full of pattern books, this one helps you find your way and voice with play and who wouldn't want that?? BTW - my favorite color to "play" with is blue. I'm always turning to my blue stash! Now who wants to win a copy? If it's a US winner they will receive a hard copy of the book, and an international winner will receive an electronic copy of the book, direct from C&T. Just leave a comment here on this post and I'll pick a random winner on Dec. 12th. 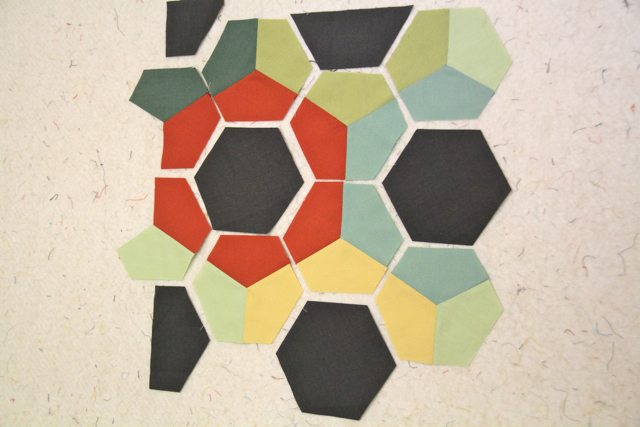 ...and got a start on my Center City quilt. A lot more work to be done but I'm on my way! For those of you in the States I hope that you have a wonderful Thanksgiving!! While making everything line up took a lot of attention, the hardest part was trimming the edges on the bias. HARD when you don't have a large space to lay the quilt out on. 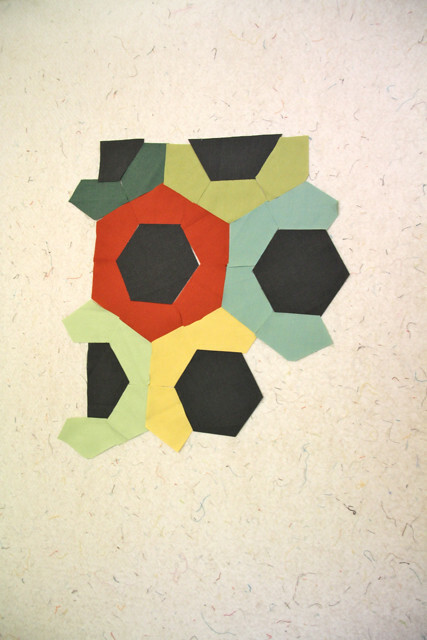 My solution was to put it up on my design wall, draw the lines on with chalk and cut the edges with scissors. Not perfect, but I'll square it up again once it's quilted! Now to think through the quilting... suggestions welcome!